Redesigning a room does not have to involve a big budget, in my experience. All I needed were three decorating tips and a few tweaks. Below is my bedroom when we first built it as a loft extension and it shows the look over 3 periods: 2015, 2017 and 2019. There were no big purchases over that time and the paint colour on the wall has remained the same. Here are the 3 things I used to get to the design I am now happy with. These small beige doors were in the old loft before we converted it and I wanted to use them as a feature. I thought they’d provide a nice contrast against the plain blue wall. But somehow I always felt something was missing. I realised later is the lack of pattern: plain against plain. I added this flamingo wallpaper which had a blue background that semi-blended into the wall but emphasised the pink flamingos a more. The paper itself cost about £25 for the roll and I used the left-over to paper the wall opposite this bed and inside the vintage bureau. The black and white rug on the floor provided a bold solid contrast pattern to the soft flamingo design. The first rug I put down was a woven rug from Urban outfitters I bought for £30 which faded after the first wash. It also has a straight geometric design which echoes the straight door and edges of the bed. The zebra rug however, whilst still black and white, had radiating stripes which I thought added to the dynamic in the room. It’s an Ikea rug I bought for £25 a few years ago. Recently, I have added more black and white elements all over my house. They look contemporary and bring a sense of freshness when juxtaposed against vintage elements and furniture which I have a collection of. 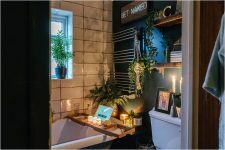 I have talked about this as adding an “unnerving” element in your interiors when juxtaposing old and new in my previous post on my bathroom revamp. There was a moment in 2017 when I felt bolder and shifted from browns and beige accessories to colour as you can see from the photo above. 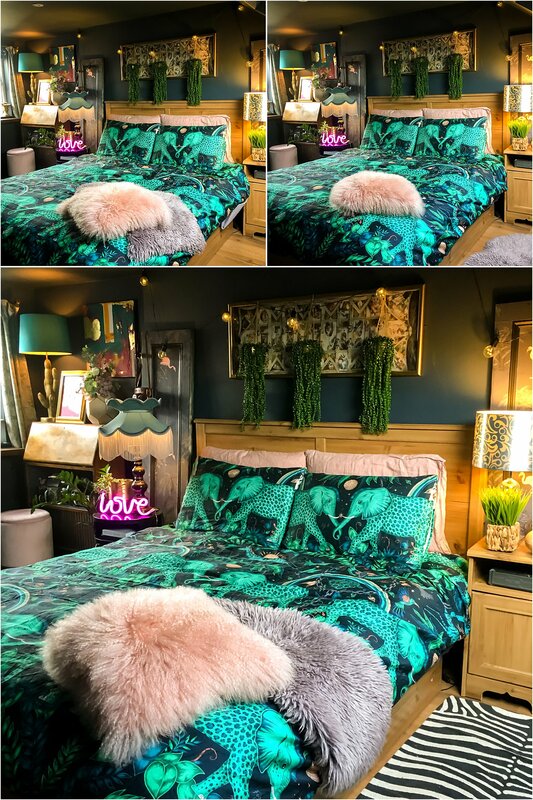 To make this shift possible without alerting my husband to an unnecessary expense, I bought this big fleecy pink throw for £15 and it softened the whole look of the bedroom. This has since become my husband’s throw as he finds a duvet too warm and this gives him his happy temperature! I want to be transparent and say I did splurge on these pink and blue linen bedding from Made.Com last year which I love and something I had been wanting for a while but this is not so much a feature but more of a comfortable treat in bed when I’m asleep. 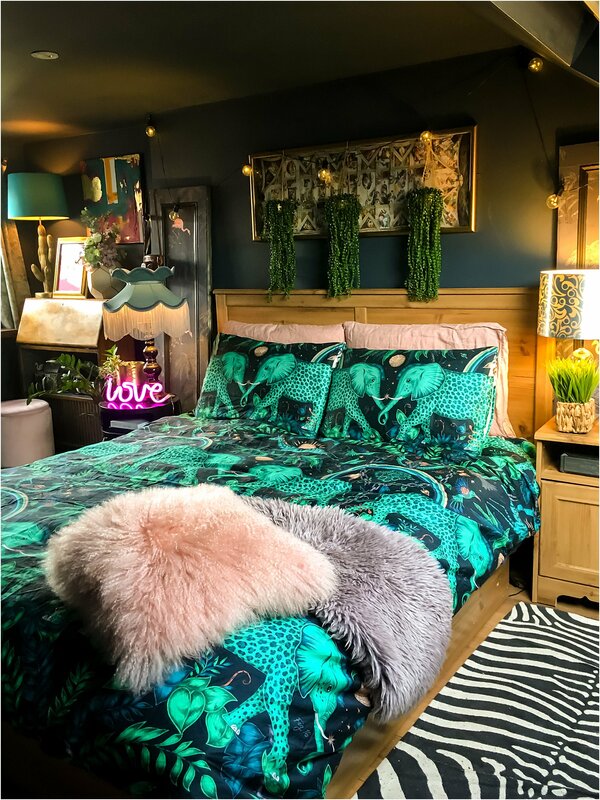 If there is anyone on Instagram who has given me massive doses of bedroom inspiration and the use of bold colours, it’s the DIY queen Pati Robins. Everyone seems to be following her so if you’re not, it’s time to check her out. I can’t tell you the number of times I’ve been asked on Instagram where I got this love light from. I got it from Ebay shipped all the way from China for £10! 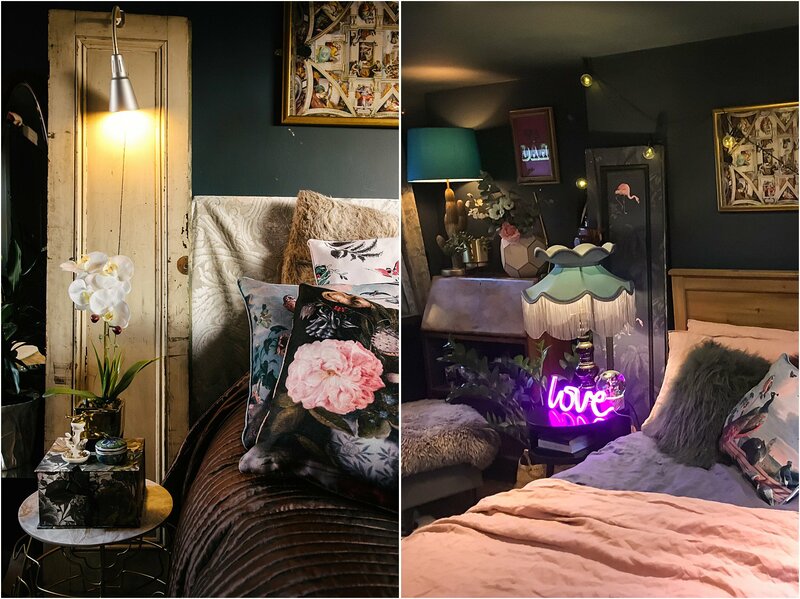 There are other small businesses on the the Instagram high street too that sell neon lights ad I have their lights too like Locomocean (purchased a party neon light from them and they gifted me a neon lounge light months later) and Mini Maison (a prize I won for winning a hashtag). You’ve probably noticed that my bedside table lamps keep changing. I switch the shades around to see how they look. I bought this vintage lampshade with a German base and a Frida Kahlo shade from a vintage fair. 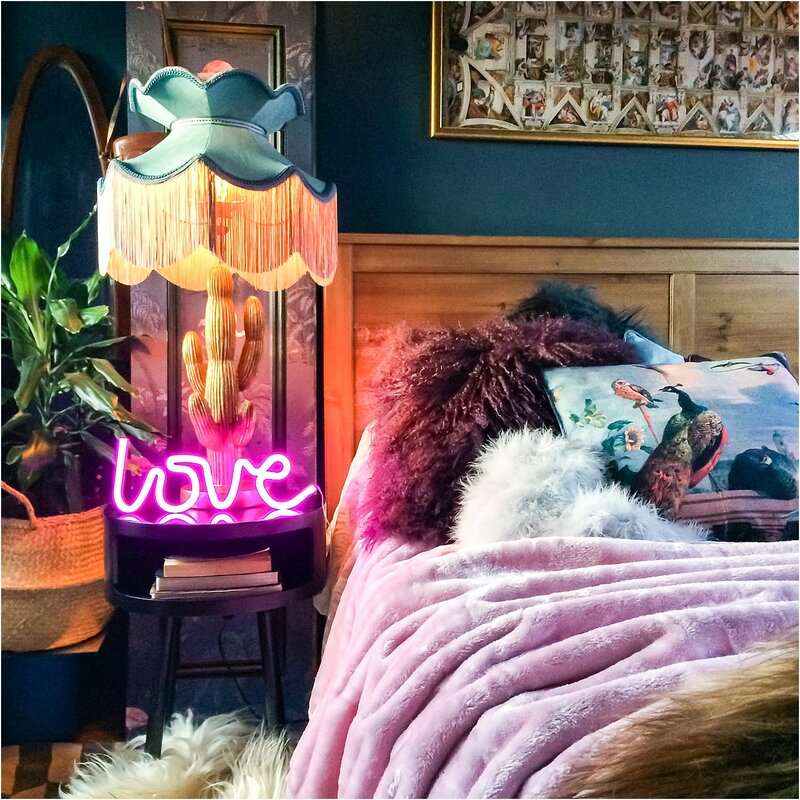 The addition of pinks meant I moved my yellow orange and green Frida lampshade elsewhere and replaced this with this amazing fringed lampshade I won from Wild Lampshades Design for a hashtag competition. Back in 2017 I was gifted some items by Out There Interiors one of which was this gold cactus base lamp. One of my friends mentioned it looks phallic and this must be in my subconscious because she sees it everywhere in my house! I wish she’d never mentioned it because now it’s hard to unsee it! Anyway, the point is that I swap accessories around to change up my room sometimes I just need to try things out to see if they work. 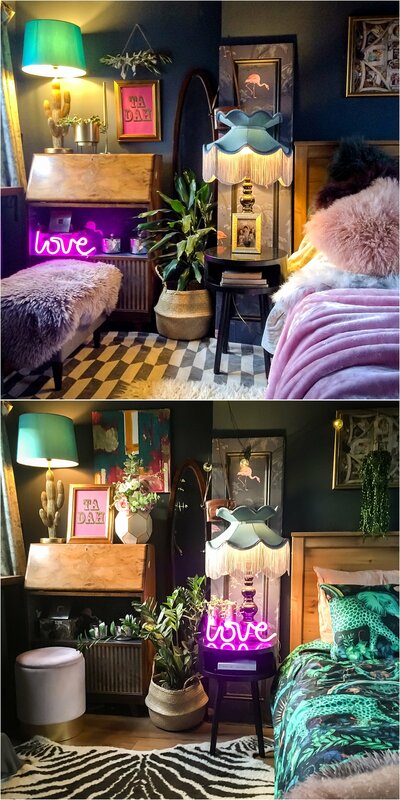 Look at the floor on the photos below, first it’s a bare floor, then I added a sheepskin and then changed it with a zebra rug from H&M £15 which was in my daughter’s bedroom. Now it’s staying here and has changed the vibe of my husband’s side of the bed just by this one thing. Green is the colour of nature and undeniably brings that sense of growth, outdoors and just pure life. I upgraded my plants in size and went bigger. I also added more faux mixed in with the real. I shop around for affordable plants and mix them up with better quality ones too. 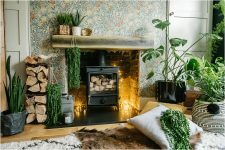 I have shared some places where I get my plants from on my post about 4 inexpensive ways to make your space cosy. 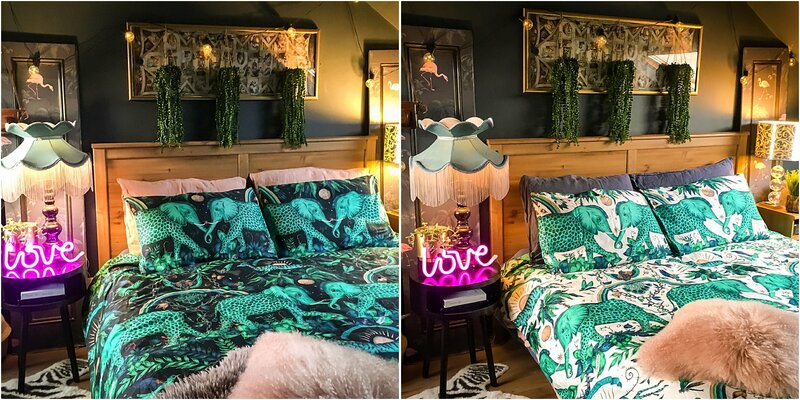 It helps that just this month Clarke and Clarke gifted me these amazing Zambezi bedding designed by Emma Shipley and the greens really pulled everything together in my bedroom for a cosy yet living and vibrant feel. This is a luxurious set at designer prices so I haven’t included it above. But there are many alternatives for other price points like H&M and Zara who do plenty of foliage design bedding. 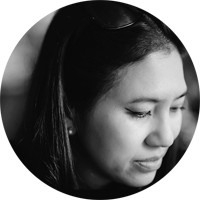 I hope you found something useful in this post that you can apply to your space . Do share your thoughts on Instagram layered.home and I’d love it if you would follow me on there too! And please share on your stories or repost on Instagram, I’d be forever grateful!